CLEAR IT SECURITY | Fort Worth, TX 76133: Best in DFW! 5 Star Rated! We don’t have a dedicated sales force. Maybe we are doing it all wrong. We believe our products, services and reviews speak for themselves. Look over our regularly updated website and contact us when you’re ready to experience the best in DFW! No amateurs. No smoke breaks. Our licensed and insured installers are mindful, pay close attention to detail and your requests to meet and exceed your expectations. No exposed wires (unless absolutely necessary!) We care about how our jobs turn out. Ever met that one tech guy who was such a jerk for whatever reasons? Yeah, well, not here! Who wants to feel less than someone else? Our techs love what they do and our customers love what we do! We wouldn’t have it any other way. We work with the latest and greatest, cutting-edge technology available! From home automation to license plate reading cameras, we actually understand the technology. The other guys still can’t figure out how we make it all work! From start to finish, we consult with you on your needs and provide solutions that meet or exceed your expectations. Our solutions are custom-tailored. No one else comes close to the Jetsons-era custom solutions we provide! Clear IT Security is a licensed and insured Private Security company registered with the State of Texas. We are a BRINKS Home Security™ Authorized Dealer but we can install, repair, service or upgrade ANY other company or brand’s equipment as well! We even work on ones that are not monitored or are being monitored by another company! We offer Brinks Home Security™ monitored systems for the FASTEST 24 hour police, fire and medical response with instant ASAP text messaging on your phone(s). Or if you prefer a self-monitored system we have systems we can setup with app/text alerts only. 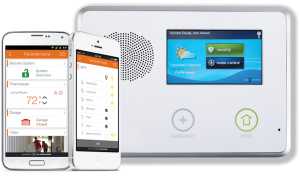 Virtually any system you may have can be upgraded to integrate with our ALARM.COM platform to make your home’s devices smart and connected! Control everything from your phone, tablet or now even your voice! Check out our best home security systems! We offer a variety of camera solutions and custom design our systems to meet your surveillance needs. Our CITS camera systems can record everything 24/7 or just when motion is detected within a specific area of the camera’s view. We can even set recording schedules, block out sensitive areas and/or setup motion alerts on specific cameras. 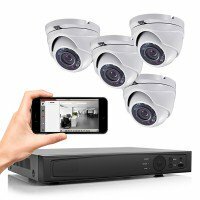 No matter your needs we have the camera system solution you need. Already have a system you want installed? We can do that too! 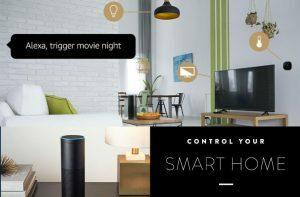 Home automation systems are capable of controlling nearly every device in your home using your phone, iPad or by preset schedules. It’s getting easier to use and manage thanks to voice control systems such as Amazon Alexa and Google Home. No longer do you have to open an app or use wall controls. Need to get up in the middle of the night? Just say: “Alexa, turn on my bedroom lights.” No fumbling for a light switch! Are you juggling multiple remotes? We can simplify your home theater or media room systems with one of our universal remote control options. From simple LCD screen remotes to color touchscreen remotes to Alexa and Google Home powered solutions that can control lights and much more, we have the best solutions! We custom program our remotes to give you one button access to the “activities” you want to do. For example, the “Watch Satellite TV” button might turn on your TV/projector, audio receiver, satellite receiver, set the appropriate inputs and allow you to control the ceiling speakers volume. While “Watch Netflix” would set everything to watch Netflix. 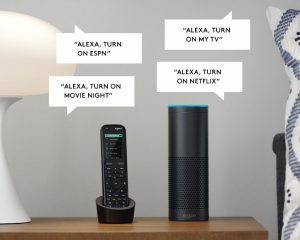 Add Alexa and let the Harmony begin by just saying “Alexa, turn on movie night” and the projector, audio receiver and Netflix turns on, sets the proper inputs and dims the lights to 50%. Upgrade your TV or movie viewing experience by having a wall mounted projector or TV installed. We can hide your wires in your walls and install IR blasters or other devices needed to control your devices from another room or behind a closed cabinet. We can mount on nearly any surface, even outside near your outdoor kitchen or pool! Brick, stone, metal, fire places – we’ve done them all and they turn out beautifully! Tired of the high cost of satellite or cable TV services? Chances are many of the programs you enjoy with your current provider are available for FREE and in crystal clear HD with one of our antennas! There are over 60 digital channels now available in the DFW area with a properly installed HD TV antenna. Add a TiVo or other brand DVR recorder and you’ll enjoy a TV guide and DVR for recording as good as or better than the one you use now! We can setup as many TVs as you want using just one antenna. Please note: splitters, amplifiers and/or boosters may be required to receive all channels clearly and supply all TV’s in your home. 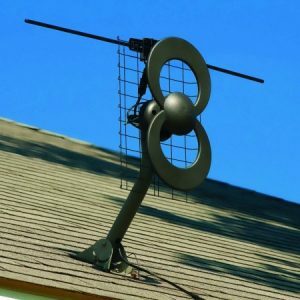 Have an HOA that restricts antennas? No problem! We typically install our antennas in your attic anyway! If you have no signal at all, dead spots or a weak signal inside your home or office but you can get a signal outside you likely need a Clear IT signal booster or amplifier installed. 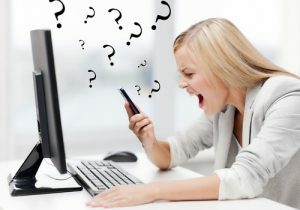 Other symptoms include: dropped calls, trouble making or receiving calls, calls breaking up or slow internet speeds on cell phones and/or hot spot devices. Metal buildings, metal roofs or radiant barrier materials used in attics are all typical reasons for poor or no cellular reception inside homes or buildings. While they are great for energy savings and longevity they are terrible for any type of radio, TV or cellular signal! Computer won’t boot up? Popup’s or redirected search results? Error messages? Slow or sluggish PC? Running out of space? Can’t remember your Windows password? Printer repairs… No matter what your issue is we have a solution! We are the IT experts in DFW! 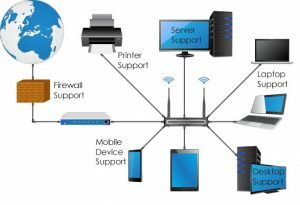 Constantly dealing with network or access issues? Need CAT5 or CAT6 cabling installed? Is your network administrator difficult to deal with? We’re not! Need a website setup or help with your existing site? Are you paying too much for phone and internet? Want to switch but need someone who knows how to cut it all over to the new service? You need Clear IT! We do it all! Is your phone or voicemail system setup the way you’d like it to be? Maybe you need your auto-attendant message updated, prompts updated, voicemail passwords reset, extensions renamed, buttons on phones reprogrammed? Strange calls to overseas numbers appearing on your bill? Beware not all techs lock down settings that can allow a hacker access to your system and the ability to make long distance calls free for them but not for you! Let’s face it criminals love to hide in the dark. 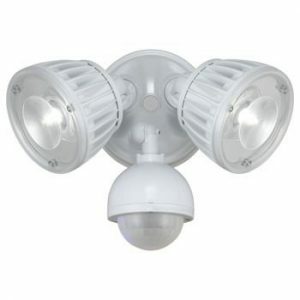 We offer the brightest LED lights in the DFW area! Not only are they the brightest but they only use 22 watts when on! We also repair TV’s and projectors, Media Room Setups with Projector Screens, Home Audio/Video Systems. These are just some of the services we offer. We offer many other “yes we can do that too” services that are CLEARLY easier to use and operate because they are carefully designed within your budget, tailored to your home or business’s needs, installed and supported by experienced professional technicians. The only question you will be left with is… What DON’T they do?! Check out our reviews online and company information on Google, Facebook, HomeAdvisor, Nextdoor and Amazon Home Services to see why Clear IT Security is trusted by more home owners and businesses! Contact Clear IT Security today! call or text us @ 817-715-8324 | send us a message | schedule and book a FREE no obligation consultation appointment online! Service area neighborhoods include: Candleridge, Summer Creek Ranch, Edgecliff Village, Crowley, TCU, Hulen, Benbrook, Ridglea, White Settlement, Keller, North Richland Hills, Watauga, Hurst, Haslet, Arlington, Kennedale, Mansfield, Waxahachie, Grand Prarie, Irving, Burleson, Joshua, Cleburne, Granbury, Bella Ranch, Bella Flora, Aledo, Weatherford, Lake Worth, Azle, Bridgeport and surrounding DFW metroplex areas – Contact us today to see if we service your area!